The dome top going home small keepsake urn features a delicate, hand crafted doves design engraved on high quality brass. Its superb finish is achieved with a lacquered enamel red, which details the floral background and contrasts beautifully with the pale silver of the doves. The dome top going home keepsake urn measures 2.5” in height. When unfilled, it weight just 0.12kg. The urn is designed to hold a small portion of the ashes of a loved one, and is intended to be used as a personal keepsake memorial. 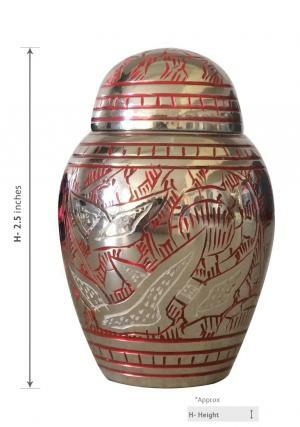 Like many of our keepsake urns, it is a partner urn to a full size piece, and may be purchased together with its counterpart or as a separate item. 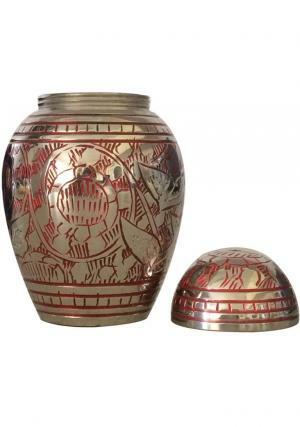 Brass urns have been used in burials and memorials since at least 7,000 BC. The dove image is strongly associated with the ancient Romans, who installed their funeral urns in columbaria. Columbarium is the Roman word for “dovecote”, and literally refers to a home for souls. A Roman columbarium often housed real doves as well, which would fly from the cote every morning to symbolise the continuing passage of life and spirit. 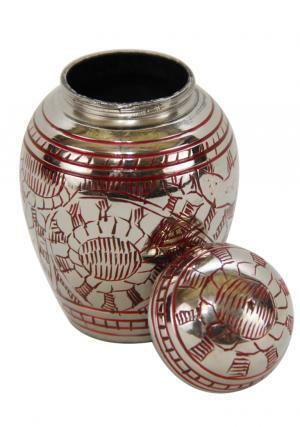 Keepsake urns are often used in home memorials, and may be kept in any domestic situation. 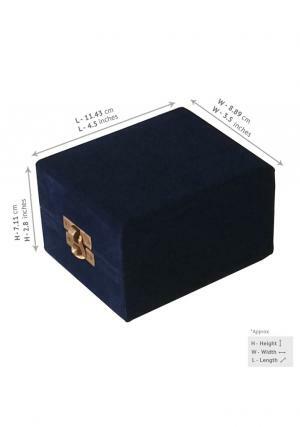 They are delivered in a presentation box, for easy and safe storage, and feature the same screw top lid as full sized urns. 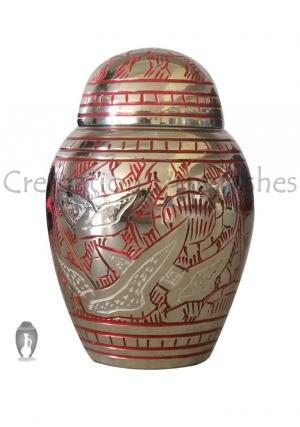 If you would like help choosing the right keepsake urn for your needs, please contact us.